Premier Yacht builder Ferretti Yacht Group are well known for the sheer style and quality of their yachts. This Flybridge Ferretti 780 is an absolute stunning model with highly detailed interior and and high quality items. The boat was designed by the renowned Italian design house Zuccon International Project located in Roma Italy. Beginning with the Flybridge the Ferretti 780 has spacious seating and relaxing space with a highly visible Flybridge helm station. The area contains a seating lounge space and fridge and wet bar. The Helm Station is Port Facing with an option to lift or lower the navigational equipment for great added functionality. The Flybridge also maintains space for a tender with installed wooded davits and also has a hydraulic crane to lift the tender. 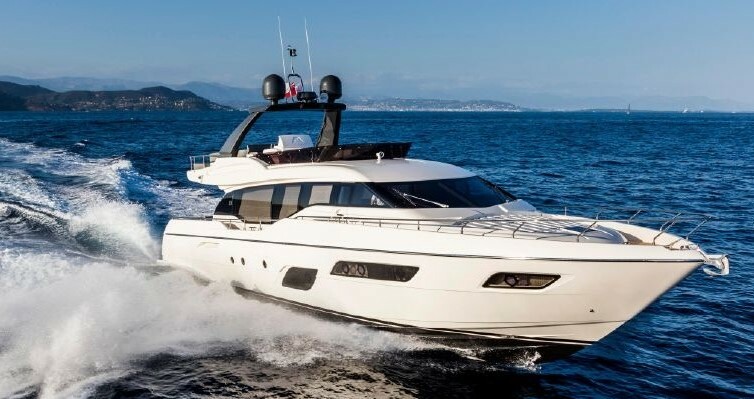 On the Ferretti 780´s main deck there is a generous stern area with engine throttles to allow for stern parking and comfortable space available for seating or other activities. The boat has high quality teak throughout which can be seen on the steps leading up to the flybridge and down to the stern bathing platform. The stern deck leads through two large sliding doors with high quality inox doors. The Ferretti 780´s has a hydraulic gangway which allows for access to the Yacht which can be controlled by a remote control. The main Saloon on the main level is spacious and fitted with high quality light wood fittings and beige carpets, the main saloon is well let and has a high quality beach club emotion. This level also holds the kitchenette and main Helm station. The saloon has interior steps leading to the flybridge and also a stairwell leading to the main bedrooms. The main bedrooms are on lower level below the Saloon and house a full beam master cabin at the aft, two twin cabins and a VIP Bow Cabin. Ferretti again have used high quality materials and forward thinking designs for the main Cabin windows and flooring. Power and performance with manufacturers top speed of 34 knots and a cruising speed of 30 knots, powered by 2 x MTU 12V 2000 M92 engines Ferretti have opted for high performance engines driving this magnificent yacht. Current Maintenance all systems are currently monitored by full time captain who maintains checks on the boats. Marlin Marine Services S.L. have also helped maintain and service specific systems onboard supporting the captain where needed. The boat is maintained to the highest standards and is in great condition.